When your tires are not properly aligned, steering is more difficult. Misaligned tires “fight” each other as they pull in different directions. Even if the direction is only slightly different from the other tires, over time your fuel economy will decrease, and steering, suspension components and tires will wear out more quickly. 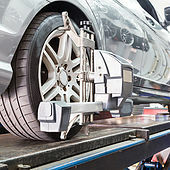 If your car is pulling to one side, the steering wheel vibrates while driving, or you have uneven tire wear, you need to make an appointment to have your alignment checked by one of our ASE-certified technicians. Give us a call or request a quote below.